A new D.C. middle school is preparing kids living in one of the city’s most underserved areas for a future in one of the world’s most in-demand fields. WASHINGTON — On Aug. 13, more than 120 sixth-graders met inside a Branch Avenue baptist church in Southeast D.C. for the first day of school. They arrived with uniforms, backpacks and a general consensus of who would be “the most popular” in the class: a 4-foot-tall robot that tells jokes on demand and goes by the name Meccanoid. Digital Pioneers Academy is one of three new D.C. public charter schools that opened for the 2018-2019 academic year. 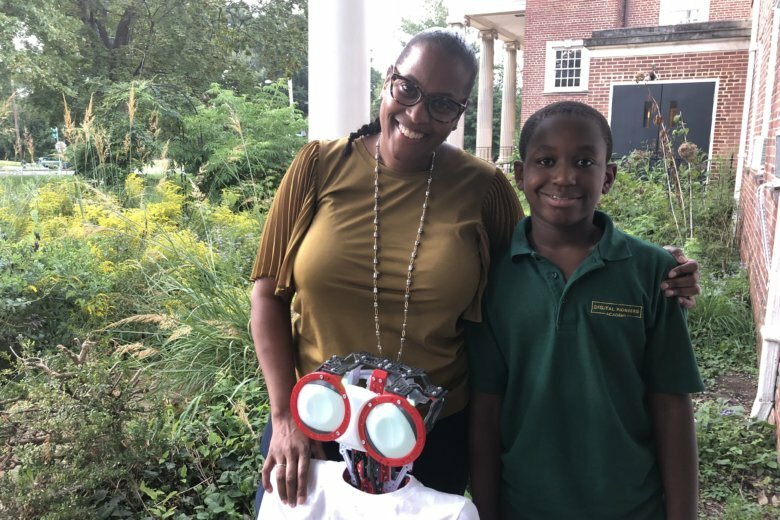 Founded by education veteran Mashea Ashton, its mission is to prepare kids living in one of the city’s most underserved areas for a future in one of the world’s most in-demand fields: STEM (science, technology, engineering and mathematics). “Our students and their families need college, but they also need real jobs — jobs that will help break the cycle of poverty that so many of our families experience,” said Ashton, who started her career in education as a teacher at Anne Beers Elementary School, a public school in D.C.’s Ward 7 neighborhood. Data from the U.S. Bureau of Labor Statistics predicts the STEM field will add 1 million new jobs to the U.S. economy by 2022. More than 90 percent of these STEM occupations pay wages “significantly” above the national average for all occupations. At Digital Pioneers Academy, computer science is a required course for students, in addition to traditional subjects, such as math and reading. By the end of this year, Ashton said the sixth-grade class will be able to design their own websites. They will also have the opportunity to take a course in robotics and learn how to create an app. “Really, we want to make sure our students not just consume the digital economy, but be a part of creating it,” she added. Opening the STEM-focused school east of the Anacostia River was another deliberate decision. In Wards 7 and 8, more than 90 percent of the population is black, and research shows a widening racial disparity in STEM occupations, where black men and women are underrepresented. “And we see that, particularly for girls and students of color, that the interest and exposure, it’s too late by the time they get to high school — they’ve already gotten a different mindset about math and computer science.” Ashton said. Digital Pioneers Academy opened this year with just its sixth grade class; the plan is to grow by a new grade level each year. As it expands, Ashton said she is looking forward to sharing best practices with other institutions interested in beefing up their academic offerings.